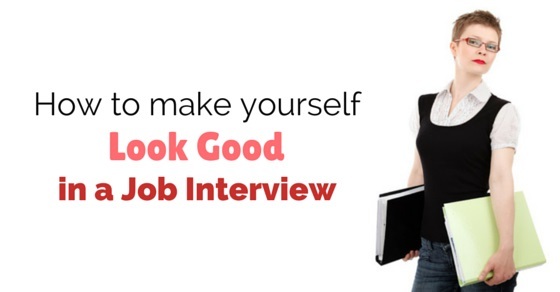 How to Make yourself Look Good in a Job Interview? A job interview is the most important phase of a job seeking process. The impression you cast during the job interview decides your fate. People who make a good first impression get easily hired into the top firms and organisations. The right look is thus very important. In many instances, knowledgeable and talented candidates fail to make the right first impression because their look has a negative impact on the minds of the recruiters. You must thus make sure that you look perfect when you head for a job interview. Here are some simple and reliable tips on how to make yourself look good in a job interview. Follow these easy tips and you are sure to find your dream job easily. The major part of your looks is determined by what you wear for an interview. Candidates who possess a good dressing sense always score well during job interview. Job interview is a formal occasion and you need to pick a formal attire to suit the occasion. There are different options in formal attires for men as well as women. Pick what suits you best and you will surely make a great start in the interview. Here are some tips for men and women regarding selection of formal attires. Men can wear formal shirts and trousers or pants when they head for a formal interview. Ideally, light coloured formal shirts are preferred during job interviews. Full sleeve shirts that fit you perfectly are ideal when you are heading for a job interview. Plain shirts without any patterns or designs are usually preferred during occasions like these. Contrasting formal dark trousers or pants can match perfectly. Tie may not be necessary for all formal interviews but if you are appearing for interviews at higher positions, it is good to wear a tie. Pick ties that carry the formal appeal. You may wear plain ties or ties with subtle patterns. Pick a pair of formal shoes to go with your formal outfit. Make sure your shoes are perfectly polished. Cufflinks go well with formal shirts. Make sure you pick accessories that are not too loud. Make sure to wear a watch in your wrist. It is an ideal accessory for formal outfits and it makes you appear time conscious. You can also carry a pen in your pocket. It adds to the formal appeal. Women have more options than men when it comes to formal outfits. Appearance matters a lot and hence women have to make the right choice of attire that suits their figure and improves their persona. Women can choose to wear formal skirts or formal trousers to go with their shirts. The skirts should be knee length. Some women have broader waists and trousers would be the best pick for such women. The shirts you choose should be light coloured and have a formal appeal. The choice of right accessories to go with their attire is important. The right pair of formal shoes add to the appeal. You may choose to wear heels or flat shoes but make sure it matches with your attire. A watch on the wrist is significant. It adds to your professional look and makes you appear time conscious. Avoid funky or coloured watches and pick something that looks elegant. You may wear a pair of earrings to go with your attire but avoid long and dangling earrings. It is best to pick short and elegant earrings that match well your formal attire. If your trouser or skirt is not fitting you perfectly, wear a belt to keep it in place. Make sure you pick a decent belt that goes with the formal look. Even if you wear the best outfit for the interview, if your hair is not done properly for an interview, you fail to create the right impact with your looks. Hairstyle is thus very important. The hairstyles that look good on formal occasions are different for men and women. Here are some simple suggestions on how to style your hair for an interview. In formal occasions like job interviews, men should always opt for short hairstyles. A perfectly trimmed short hair goes best for men. You may opt to have a side parting or no parting at all. Pick a style that makes you look smart and intelligent. If you are applying for a position in a creative firm, then you can have a more casual approach. Creative firms usually accept candidates with long and funky hairstyles too. Women have more options when it comes to choosing hairstyles for job interviews. They may have their hair tied in a bun. This looks formal and gives your face a professional appeal. The other option would be to tie a single pony. This is a good option for women with medium length hair. Women may also have short hairstyles like boy cut or bob cut. As long as the hair is well set and not falling on your face, they are acceptable in professional circles. The right kind of makeup can make a big difference for professional women. Women need to take excess care to keep the makeup subtle and minimum. A little lipstick, eyeliner and sun’s cream makes you appear professional and mature. Excess make up can spoil the whole show. You must select simple shades for lipstick and nail colour. It is better to avoid loud shades of red, orange and pick when you are heading for a job interview. It is always wiser to select subtle shades that simply accentuate your features and make you look impressive. Apart from the above mentioned factors, there are other things that define your looks and persona in a job interview. These are your habits and manners. Hygiene habits make a great impact on the minds of the interviewers. Another thing that counts a lot is freshness. If you appear weak and fatigued, the interviewers won’t have a great impression about you during the interview. You need to look fresh and enthusiastic during the interview. The best thing to do is wash your face at regular intervals. It helps you appear fresh all day long. If you are travelling to the interview location, it is a great idea to carry a face wash along. You can use hand sanitisers to keep your hands fresh. If you sweat frequently, carry a deodorant along with you when you head for the interview. If you appear fresh and eager, it will also add to your confidence. The perfect look can only be complete when you have the perfect attitude. There are many traits that your look should reflect and these can be summed up in one word-‘attitude’. Here are some tips that will help you reflect the perfect attitude through your looks. Confidence is often reflected through your looks and body language. You must make sure you use the right body language. If you fumble or hesitate, it is a clear sign of lack of confidence. Look straight into the eye of the interviewer when you speak to him. He must know you are sure of what you are speaking. This is a sure way to add weightage to your profile. Your expressions not just add to your looks, they also reveal your true emotions. You need to make sure that you use the right expressions at the right place. This is a great strategy to look mature and smart. Use it and your appearance is bound to have a lasting impression on the minds of the interviewers. While most professions do not look for exceptional looks in their candidates, looks do matter a lot in most professions. When you are planning to work for a firm or organisation, you need to possess a good persona. Good looks is an important component of a good personality. There are some professions where looks matter most while there are other professions where looks are of significance but not extremely important. If you are applying for a modelling job, be prepared to be evaluated on the basis of your looks. In these jobs, the hiring managers evaluate your facial appearance, your built and your height before deciding to hire you. If you are applying for a marketing or sales position, you are going to be the face of the firm while interacting with clients and customers. Good looks could help you a lot in careers in marketing and sales. If you are seeking an office type job where you simply need to complete the task assigned to you and leave, looks may hold lower prominence than in other jobs. Yet, looks do matter even in such jobs. If you present and carry yourself well, you are bound to land up in the right job easily.